Wayne Gretzky, known as The Great One, was one of the greatest hockey players of all time. Encouraged by his parents, Walter and Phyllis, Gretzky started skating at the age of two; hockey quickly became a major focus for this young prodigy. Gretzky turned professional at the age of 18 and rose through the hockey ranks, displaying great skill and establishing scoring records. He retired his jersey (Number 99) ironically in 1999 after four Stanley Cup wins, numerous trophies for Most Valuable Player and with then-unrivaled statistics. Gretzky has remained involved in hockey management and coaching, but is also a humanitarian. He started the Wayne Gretzky Foundation in 2002, and since 1995 has been helping to raise funds for the Canadian National Institute for the Blind. Gretzky’s boyhood home, and the backyard rink that transformed his talent and the game of hockey, was designated a heritage property in 1999. Read why Gretzky’s boyhood home was designated a heritage property by visiting the Ontario Heritage Properties Database. Learn more about Gretzky and his achievements on the Hockey Hall of Fame website. 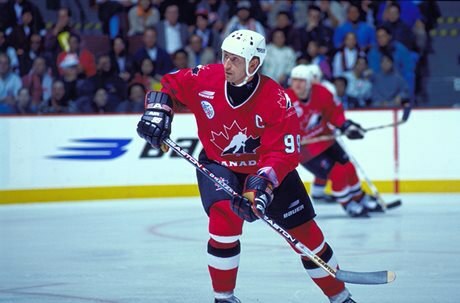 Watch Historica Canada’s Heritage Minutes video on Gretzky.